An online map of publicly accessible defibrillators was launched in The Bush Hotel in Carrick-on-Shannon on March 14. The map is available online at www.leitrimdefib.com and on the websites of Leitrim Public Participation Network and Leitrim Volunteering Information Service. Members of Community Defibrillator Schemes and First Responder Groups from across Leitrim gathered with representatives of the National Ambulance Service and Leitrim’s Gardai and Fire Service to see how the map can be easily used to pinpoint the nearest Automated External Defibrillator (AED) in the case of an emergency. 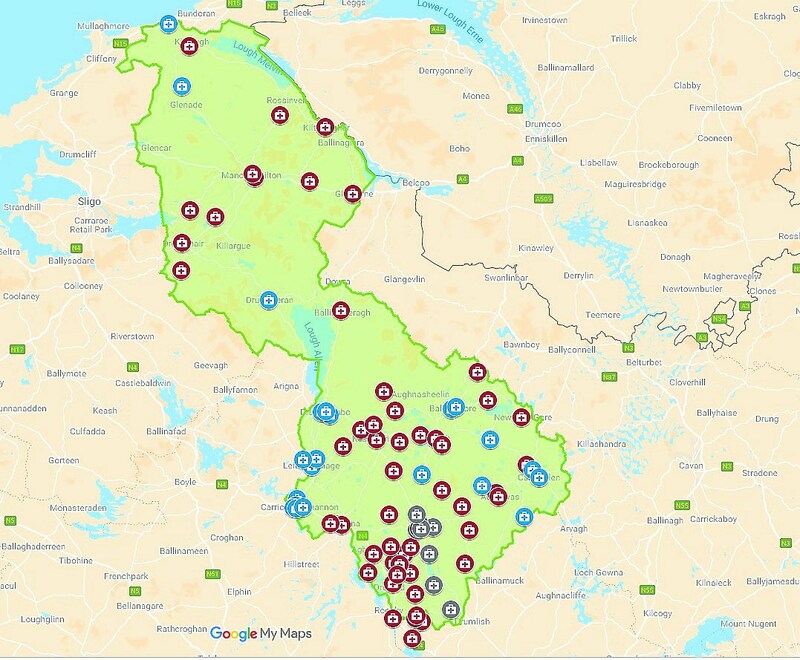 A collaboration between Leitrim Volunteering Information Service, Leitrim PPN, Leitrim Development Company and South Leitrim Community Network, the map represents the first and most comprehensive mapping of public defibrillators anywhere in Ireland. The need for this map was identified at a meeting of South Leitrim Community Network. Leitrim Public Participation Network has links across Leitrim’s community sector and was well-placed to look for the information needed. Caillin Reynolds, of Leitrim Volunteering Information Service compiled the data and developed the map. Working in close partnership with the National Ambulance Service (NAS), the project has now provided the NAS with a database of the locations and eircodes of many defibrillators in the county, so they can direct individuals to their nearest location in an emergency situation. A demonstration from Caillin showed how easily the map can be used. Each defibrillator location has been mapped online via google maps and people can access information quickly via their smartphone, laptop or tablet. The online map allows you to get directions to your nearest defibrillator quickly and easily. It contains vital information such as the address, the eircode, the location, and the times the defibrillator can be accessed. Bernie Donoghue, Leitrim Development Company, acknowledged the great response from community groups, schools, GAA clubs and individuals throughout the county. Supt Kevin English and Mark Callanane, Community Engagement Officer with the National Ambulance Service publicly congratulated Leitrim’s community and agencies on the achievement of this project. Both emphasised the fact that it could save lives and that the time to look your map and know your nearest AED is now, and not when there’s a problem. Tracy Ferguson of Leitrim PPN alerted the groups to possible funding opportunities for existing and new schemes and acknowledged that the project is ongoing. If you know the location of a public defibrillator in Leitrim please get in touch as soon as you can. You can contact Cailin or Bernie at 07196 31715 or Tracy at 087 183 1253. Alternatively, email LeitrimAED@gmail.com and save a life today!